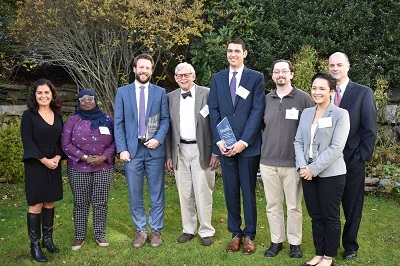 This year, over 65 nonprofit board members were nominated by the community, and Camden National Bank’s Leaders & Luminaries independent selection committee chose two Emerging Leaders receiving $1,000 each, and four Grand Prize winners receiving $5,000 each for their respective organizations. This year’s honorees serve as board directors at Brunswick-Topsham Land Trust, Milestone Recovery, Maine Coast Fishermen’s Association, Maine Inside Out, Hardy Girls Healthy Women and The Game Loft. • Brad Babson, Board President, Brunswick-Topsham Land Trust - The Brunswick-Topsham Land Trust’s (BTLT) mission is to preserve, protect and steward the cherished landscapes and rich natural resources of our communities. As Board President, Brad led an innovative 50-year lease agreement that allows the farmers to build equity in their farm business and allows the land trust to enter into a secure, long-term arrangement. As a result of Brad’s leadership, the BTLT has seen a remarkable increase in institutional capacity and sustainability. • Samaa Abdurraqib, Board Co-Chair, Maine Inside Out - Maine Inside Out initiates dialogue, develops leadership and builds community across boundaries using original theater, inside and outside of correctional facilities. Samaa’s background includes activism and community organizing, and she first joined Maine Inside Out in its fledgling stages. She brought her passion for the mission and her professional expertise in facilitation to make an immediate impact by supporting board members to hold difficult, but important, conversations. Since Samaa joined, Maine Inside Out has successfully navigated nearly doubling in budget and staff capacity. • Gerry Cushman, Board Chair, Maine Coast Fishermen’s Association - Gerry is a founding member of Maine Coast Fisherman’s Association (MCFA), and he has served as Chair for eight years. He has been instrumental in growing the organization from a small group of fishermen to a nationally-recognized nonprofit leading innovative project and policy initiatives across the country. A resident of Port Clyde, Maine, Gerry is a lobster fisherman and a lifelong advocate for community-based fishing, supported by a healthy Gulf of Maine ecosystem. Gerry’s strategic leadership has brought MCFA to the next level of financial stability and impact. • Ryan Ciriello, Development Committee Chair, Milestone Recovery - Ryan first found Milestone Recovery in the Emerging Leaders Program, now run by the Maine Association of Nonprofits. He immediately brought data-driven strategies to maximize the organization’s effectiveness and to advance their financial stability. The mission of Milestone Recovery is to provide the best quality of services to empower individuals with substance use and behavioral health disorders to attain stability, dignity, recovery and an enhanced quality of life. Ryan has been a creative and energetic fundraiser, helping to increase sponsorships for their annual event by 87% in just one year. • Chelsea Ellis, Board Director, Hardy Girls Healthy Women - Chelsea is a graphic designer, social media manager and freelance photographer. She was immediately inspired by Hardy Girls Healthy Women’s mission to take girls seriously and put the power in their hands to challenge a society that ignores their brilliance. Tapping into her marketing and communications talents, Chelsea took the organization’s annual fundraiser from a 100-person event, raising $30,000 annually, to a 250-person event that raised $60,000. She also uses her graphic design expertise to create messaging that clearly conveys the impact of the organization. • Steven Bishop, Treasurer, The Game Loft - Steven first discovered The Game Loft as a kid where he witnesses first-hand their mission to promote positive youth development through non-electronic games and community involvement. As a young adult, Steven learned bookkeeping in order to help The Game Loft succeed, and he joined the board shortly after. Using his newfound skills, Steven went on to secure a junior accountant role at Harvard University, where he is also enrolled as a student. He is the first in his family to attend college, and he will graduate from Harvard in May 2019. An inspiring advocate of The Game Loft, Steven has brought energy, leadership and greater sustainability to the organization.